Campers took their last dip in the camp pool today before headed back to their cabins to pack. Campers will be placing their wet swim suits and towels into plastic bags to take home tonight, so parents watch for those when you start unpacking! Lunch this afternoon was Corn dogs, cooked carrots, tater tots, fruit and garden salad! We have campers practicing archery as well as climbing the rock wall this morning! Breakfast this morning was waffles, sausage links, toast, cereal with milk, and fruit juice! Tonight we will talk about the story of David sparing Saul's Life. It's a great story that comes to us from the book of 1 Samuel 24 We will sing Sanctuary as well as Father I Adore You. Tonight is also the night the children have the opportunity to ask Jesus into their hearts. The campers will also have the opportunity to take communion. Dinner tonight was Chicken & Noodles, mashed potatoes, green peas, garden salad and a very special desert.... S'MORES! Campers enjoyed marshmallows roasted over a campfire as they smashed them between two crackers and added some chocolate bar! It was so much fun! Our nighttime snack tonight will be pretzels! This afternoon our panda's tried the climbing wall, the turtles practiced their role play while the foxes and the otters had family time! Everyone met back up to swim at the pool today too! Our afternoon snack today is fruit! The panda's had both family time and low ropes today, while the Foxes did crafts and Archery. The Turtles had family time and crafts, while the otters did a science project! What a busy day! This morning we have scrambled eggs, bacon, has browns, toast, cereal, and fruit juice! Dinner tonight is TACO NIGHT! Always a Rivervale favorite, at our fiesta we're having beef tacos with all the fixin's, chips with nacho cheese, rice, and churros for desert! 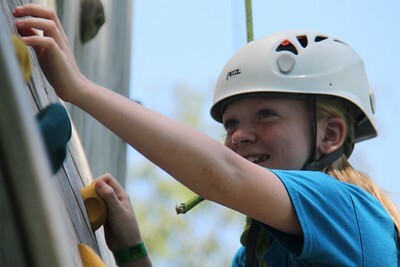 Today our campers participated in a nature walk, scaled the climbing wall, and took a ride on the zip line! They cooled off afterward with a pouch of fruit snacks and jumped into the pool! Tonight in worship we learned about the story of Samuel anointing David as King. God looked at David's heart and saw that it was good, and so God chose David to be the king over Israel! You can read the story here in 1 Samuel 16. 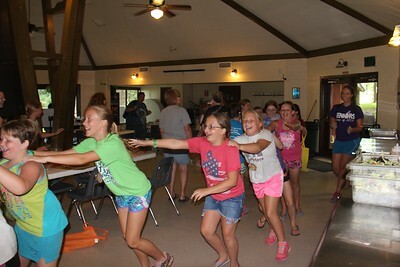 Our campers also sang Create in Me, Give Thanks to the Lord, as well as The Lord Looks at the Heart. For Lunch today we had cheese burgers, potato wedges, corn, salad and apple slices! 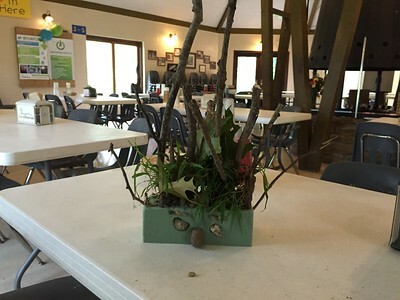 The Foxes submitted their nature centerpiece for the contest today. We'll announce the winners by Friday! Stay tuned for more from each of our family groups this week. For breakfast today our campers had pancakes, sausage patties, cereal, toast and bagels, with orange juice to drink! Worship tonight is about the Creation Story, which our campers will experience through a skit acted out by some of the counselors and directors here with them this week! They will also be singing Rise and Sing, All Around the World and Jesus Loves Me. Tonight for dinner our campers had their choice of pepperoni, sausage or cheese pizza, a garden salad, and chocolate chip cookies! Yum!! !